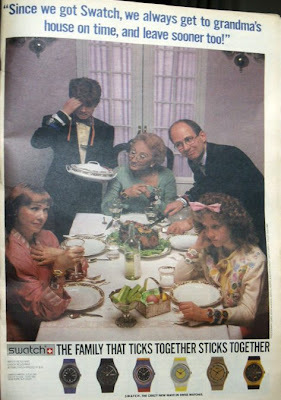 This week I'm going to do a few "old school" preppy posts. You know how the saying goes, "good style never goes out of style." This is especially true in the preppy world. Lilly Pulitzer came out with a line of fun, preppy, and inexpensive watches. At $19.95 for a set of two interchangable watch bands is a true bargain. The watches are packaged in an adorable gift box. The minnies both got the watches for Valentine's Day and were ticked pink with their gift. I tried the watch on my wrist for fun and it looks great on my wrist and the girls' tiny wrists. The watch sets come in 3 different patterns: Later Gator, Patchtastic, and Desert Tortoise. My favorite is Later Gator. 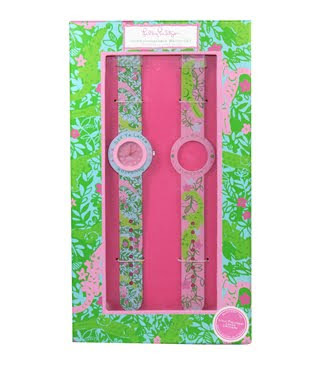 The Lilly Pulitzer watches are made of a material that reminds me of the Swatches that I used to have as a little girl. The only thing that would have been better would have been for them to be scented like the old watches! I'm wondering if the trend of wearing more than one watch on your wrist will make a comeback, too. 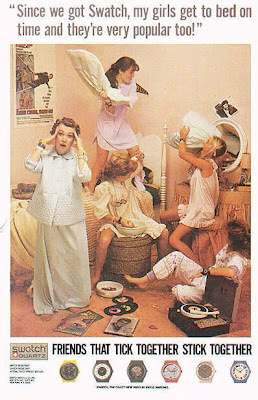 Here are some great retro Swatch ads. Oh, how I loved my swatch! Those LP watches are great! Gave one to my minnie for Valentine's day too! She loved it. They are so cute. I love the Swatch store in NYC. So many memories. Those watches are a perfect gift for Minnies, too cute! We have those at our store, and I think they are so cute... maybe I should swipe one - or should I say SWATCH one?!?!? I am so silly!